Can’t get enough talking with your friends, family and loved ones? Register now to the new Unlimited Calls with Smart Prepaid Smartalk 100 and Smartalk 500 Promo! Enjoy non-stop chikkahan for five days or for a month and free 30MB internet surfing. Choose from Smartalk 100 and Smartalk 500. Call anywhere you are with these exciting promos! Experiencing SMART calls at its best? Keep connected with our new call promos! See more informations in our Facebook page: www.facebook.com/Unlipromo. We higly appreciate your visit. 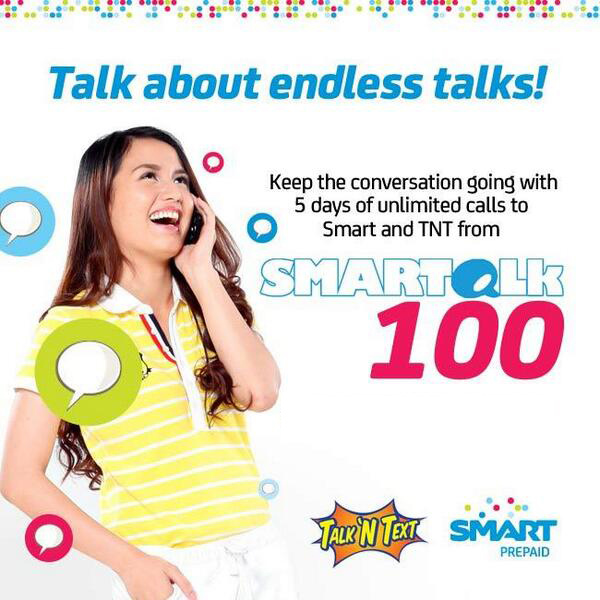 Enjoy Unlimited Calls with Smart Prepaid Smartalk 100 and Smartalk 500 Promo! See www.smart.com.ph for more details.